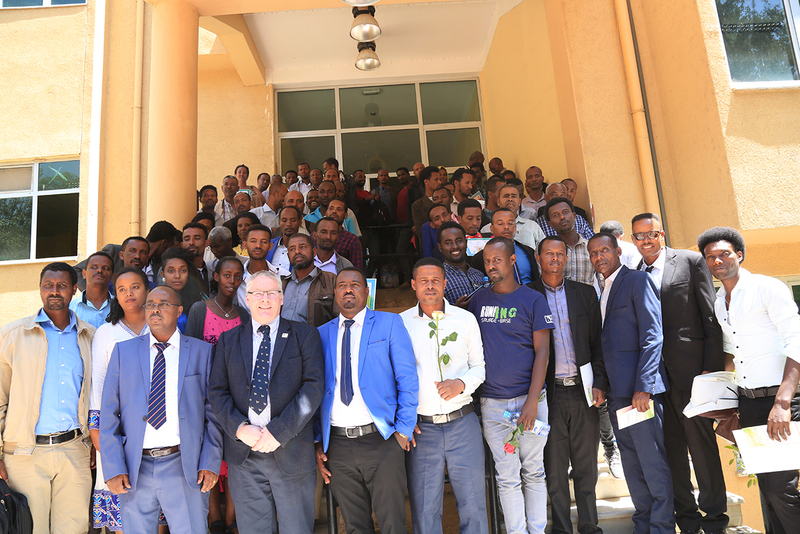 The Society for the Protection of Animals Abroad (SPANA) certified 62 trainees in Humane Education during the ceremony held at the College of Veterinary Medicine and Agriculture of Addis Ababa University, Bishoftu Campus on March 25, 2019. The training was offered for five consecutive weeks on protecting and caring for working animals. The trainees were from Oromia, SNNP and Amhara regional states. Humane Education is teaching of compassion and respect related to animal welfare principally concerned with the development of the learner into a more thoughtful, caring and engaged member of society for animal protection. SPANA which collaboratively works with the College of Veterinary Medicine and Agriculture of Addis Ababa University trained 62 trainees selected from primary schools. The trainees have successfully completed their course and were the 2nd round to come out as graduates of humane educators. Dr Dika Ayana, Dean, College of Veterinary Medicine and Agriculture, extending his congratulatory message to the trainees noted that taking the course by itself is not enough but expected to deliver what they have been offered to others. “SPANA is extensively working to improve the health care and welfare through the provision of treatment and training of the local community on how to handle their working animals better,” said Dr Dinka. Dr Teferi Abebe, SPANA Country Director, for his part noted that SPANA has been working for the last fifteen years about protecting and caring for working animals. He added that the establishment of the project in Bishoftu Campus also provides an environment for veterinary students to learn and practice with veterinary medicine skills. “To further address problems related to working animals’ care and protection the project is expanding its service delivery at woreda level,” said Dr Teferi. SPANA is a UK based international animal welfare organization that cares for and protects working animals.